Montebello Mom: Harlem Globetrotters in So. Cal & Enter to Win a Family Ticket 4 Pack! Harlem Globetrotters in So. Cal & Enter to Win a Family Ticket 4 Pack! And buckets of confetti thrown at me! The Globetrotters are coming to the Southland! Catch their antics, jokes, and basketball skills that will amaze you and have you laughing out loud. 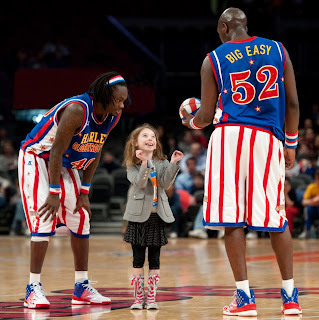 Tickets to see the world’s most famous basketball team start as low as $16and are available at www.harlemglobetrotters.com, or through the venue box offices. Visit MontebelloMom on Facebook, & leave a comment under the Globetrotter post for a chance to win a family 4-pack of ticket vouchers to see the Globetrotters play! Giveaway rules: Deadline to enter is Wednesday, February 17, 2016, at 4pm PST. The winning entry will be chosen by a random number generator and the winner will be contacted via Facebook messaging. Winner will be mailed a four pack of ticket vouchers good for any Harlem Globetrotter game at the Citizens Bank Arena or Staples venues for 2016. Vouchers must be taken to the arena box office for redemption, for the best seats redeem the vouchers as soon as possible. Tickets will be delivered via the United States Postal Service, or by another method agreed upon by MontebelloMom & the winner. One Facebook comment per person please.